Hey Malaysia, Selamat Hari Merdeka! Despite everything, I ♥ my country. I know, photo is irrelevant but how about a short read on the recent developments of my teeth? ;) If you look closely, you can actually see a tiny difference in my teeth, something added to mark another milestone in my Invisalign journey. I've had attachments added to my upper row of teeth. I know you've seen me mention this a few times and you must be wondering, what are attachments? RAWR. Not a glam photo, I admit. I did photograph the whole process of adding the attachments, but it seemed too gross to be posted here XD Luckily, my dentist demonstrated on a teeth model for me so now I'm able to show you step by step how it's all done! First things first, attachments, otherwise known as 'buttons', are little bits of added to the teeth to help your aligners 'grip' on better. 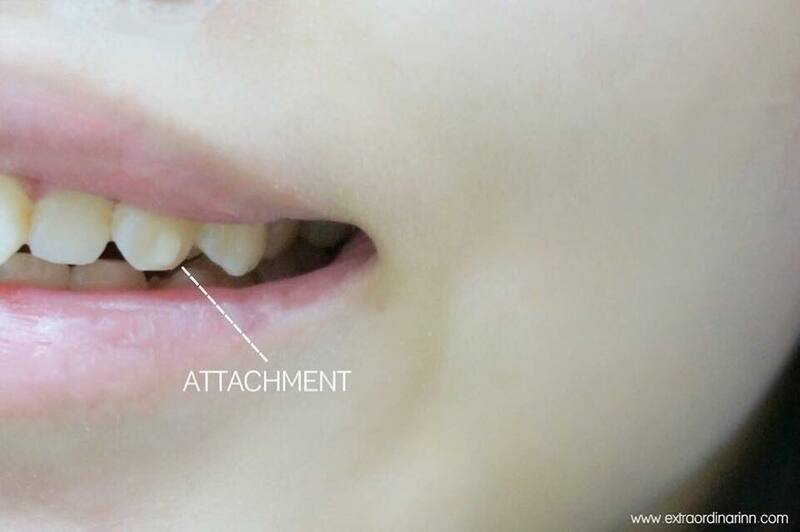 Just like how brackets are for metal braces, attachments are the little 'brackets' for Invisalign. It helps your teeth to move by helping your aligners hold on to the more challenging teeth and reduce the chances of your aligners slipping off from the smooth teeth surface. To put it in simpler terms, Dr Matthew's analogy is like this: If you grip onto a person's wet hand/ wrist, there is less friction and your hand can slide off easily. However, if that person is wearing a watch, you are able to grip onto them better. FYI, attachments are made of the same thing used to do fillings. First of all, Dr Matthew had an extra pair of aligners shaped like my teeth and he cut it in half before fitting it to my teeth to gauge the position of the attachments. My teeth are cleaned first before anything is done. Etching is done first. 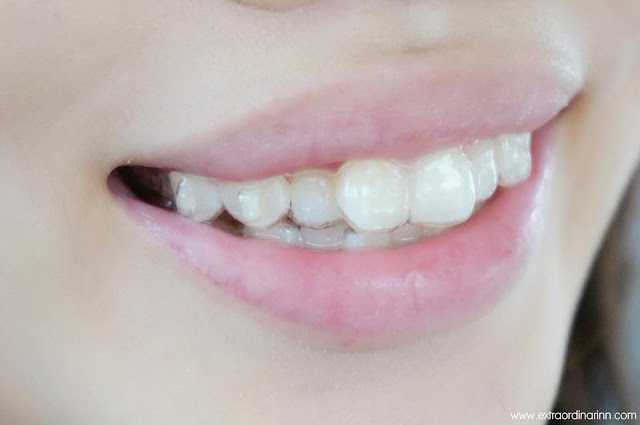 The etching gel phosphoric acid is used to clean the surface of the teeth and get rid of any unevenness so the attachments can grip on better. This liquid also tastes kinda sour as it gets sprayed on my tooth. Next, these green things known as composite resin is placed on the surface of the teeth. These are sort of like the 'glue'. Now comes the fun part - using G-Bond for the bonding process. It is the part where the attachments are formed and will ultimately harden to become the final product. This part is interesting. Dr Matthew demonstrated by squeezing some of the bond on my fingernail (don't worry, there's no glue so it didn't stick on). It comes out in a soft, gel-like form at first and will harden upon curing under the UV light. Light cure is then done with the UV light to harden the bond. The light is placed over my teeth for a few minutes and it will form a solid residue on my teeth. Dr Matthew describes this process similar to how we girls get gel manicure done! The light curing process is also the reason why I had to wear protective glasses. The whole process only took about half an hour for my upper row of teeth. Here's how the final product looks like! It felt weird on the first day because I kept feeling like there's something rubbing against my lips but now I've gotten used to it. My teeth also felt weirdly smooth because of the etching. Initially, the attachments are also white in colour because they are freshly applied, so if you look closely, it looked odd when I smiled. Now the attachments have blended to my normal tooth colour so its barely noticeable. 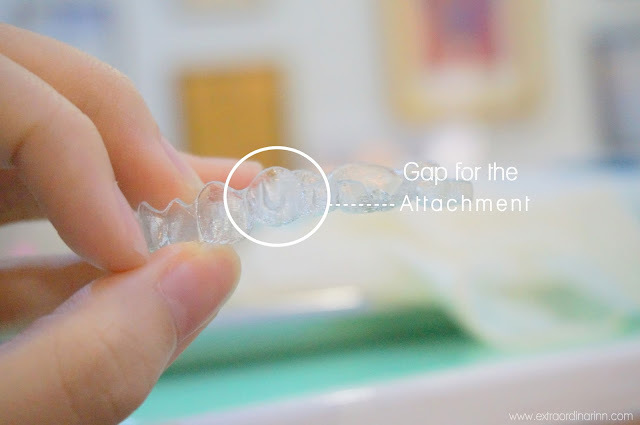 Unlike the previous aligners which are completely flat and smooth, aligners #4 onwards will have these gaps on them to fill the attachments. So here's how it looks like after putting the aligners on. It's more noticeable now, but only barely. So far, no one has commented on the weird protruding thing on my teeth so I guess it's all good. Quite glad that I chose to put the four front attachments at the back though! Do note that as the attachments are made of the same thing as fillings, there is a possibility of them falling off as well. But Dr Matthew said it's not a big problem as there are other attachments to help with the grip. Morever, I go back for checkups quite often so he can attach it back again easily. FYI, I had 8 attachments on but by the next morning, I only had 3 left HAHA. 4 had already fallen off while eating (I might have swallowed it.. but no harm done) and one fell off as I pulled out my aligners out quickly to brush my teeth. Now I'm extra careful with putting on and taking off my aligners. Drop them a LIKE if you happen to visit their page! Until then, stay tuned to my next update (which will most probably be adding on the bottom attachments)!